Several Audi and VW models suffer from the common dead / fading / disappearing pixel problem on the instrument cluster (also on the board computer) - on the large LCD display that shows valuable data such as the mileage and the on board computer messages. The pixel problem lies with the LCD display. Lcd display is very important for car’s instrument cluster, a good lcd display can help you see the information more clearly and also help you save more money. Dead LCD pixels, fading LCD pixel on the instrument cluster are quite bad looking parts of a good car’s interior, so it is understandable that you may want to get it fixed. Replacement of the complete unit is quite expensive, that is why we try to encourage people to get it fixed by a professional on half price, or do the ribbon cable replacement at home on tenth price. As we sell quality flexible ribbon cables, bulbs / lamps only for DIY repair. This very common pixel failure is known on several units, like dashboard instrument cluster (speedometer), MID, and radio units, OBC (on board computer), and SID, and happen to several CAR manufacturers that use Siemens VDO electronics such as BMW 3 5 7 series, Audi A3 A4 A6 A8, VW, Seat, Mercedes C and E class, SAAB & Rover - you will find several different models on our site. Sacer has 3 important remarks to all those who already ordered the spare parts for their cars: --> 1. Read the complete instructions before starting the ribbon cable replacement.--> 2. Technical support is always available - on the phone, or via E-mail – please feel free to ask at any time!--> 3. Always feel free to live with the opportunity mentioned on the last page of the instructions booklet! 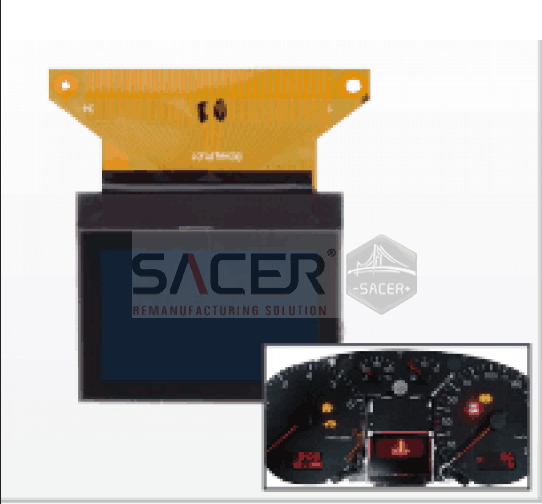 Sacer developed a new lcd display with FPC for Audi A3 / A4 / A6, VW Passat / Golf 4, Seat, Skoda VDO group only (1999-2004) instrument cluster. COG LCD display with FPC cable. Soldering is not necessary. Total 34 pins from FPC side. For VDO group. Sacer can provide Audi VW lcd display with high quality and attractive price for you. Sacer is a steadily growing manufacturer funded by highly skilled and experienced electronic engineers in 2007, which develops and produces electronic control modules in the automotive aftermarket. We have our own engineering team in Europe, together with more than 100 employees in China and we manage to create the Quality Bridge between European design and Chinese manufacture. Welcome to visit www.sacer-shop.com or contact with us by shop@sacer.com.cn for more information.